Marion, Ind. native Kelsey Warren has joined the staff of the Brethren Missionary Herald Company, Winona Lake, Ind., as editorial assistant. In her new role she will help with the editorial needs of BMH Books and FGBC World, serve as the office receptionist, and take orders for BMH Books, among other responsibilities. A May 2010 graduate of Taylor University, she has a B.A. degree in English literature with minors in English writing and studio art. Her concentration was in new media communication. 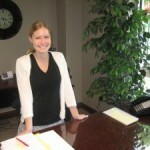 Since late May, she has worked as an intern in the BMH office. She comes to BMH with extensive publication experience with the art and literature journal of Taylor University, and has worked at the university’s writing center with college students, graduate students, and faculty on their writing. She studied abroad in London, England, in 2007 and she has given a number of presentations at academic gatherings and conferences. In a few weeks, she and Nathan Mitchener will be married. They plan to live in Columbia City, Ind. In addition to her literature and academic work, Kelsey is also a runner, having run five mini-marathons, one marathon, and various 5-12K races.